This 8 x 9 shed has an apex roof that gives you immediate extra head height as you enter the building. This is great news if you have a number of tall and bulky tools that you wish to store. Other features include special flame retardant safety panels in the building, sliding doors and an incredibly strong hot dipped galvanised steel construction. 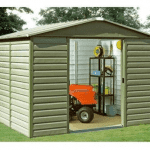 This is a solid, good sized metal storage shed built with an apex style roof. 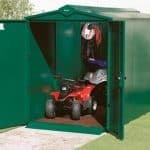 Designed with stability and safety in mind, the shed is ideal for storing machinery and other heavy items. The roofs design means rainwater runs straight off, down onto the ground. It doesn’t have chance to build up and cause damage to the materials. It also provides the added benefit of giving the shed more internal height than other roof types. To highlight just how tall this building is, the roof measures 1.92m, while the eaves of the shed measure 1.63m. It also provides a good amount of storage, measuring 2.80m in depth and 2.42m in width. We like that this shed has been designed with a more untraditional look. The cladding is horizontal, rather than vertical which helps to provide an attractive, unique style. You can tell just by looking at the construction of the building that it is tough, durable and weatherproof. This is largely thanks to the hot dipped galvanised steel frame. Ensuring the building is fully supported, this frame will not deteriorate over time. The vinyl/metal cladding gives excellent reassurance that the shed will withstand many years of wear and tear. 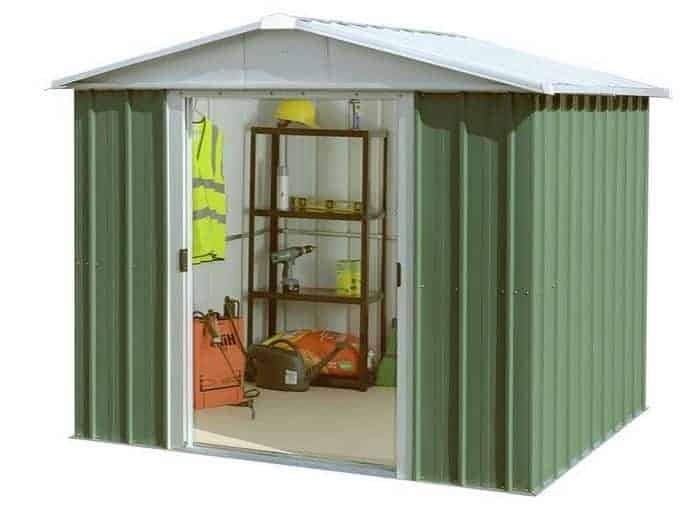 Unlike a lot of sheds provided by Waltons, the Yardmaster metal sheds don’t come with a floor. The good thing about this is you can store very heavy items without worrying about the floor caving in. The bad thing is it affects where you can actually assemble the shed. It will need to be assembled on an extremely solid surface such as paving slabs, timber decking or concrete. Of course, you can always buy and fit paving slabs or concrete before you assemble the shed, but it will obviously increase the price you have to pay, not forgetting the extra effort you will have to put in. This Yardmaster shed doesn’t need any form of treatment. The hot dipped galvanised metal provides fantastic year round protection without the need for special sealants. Not only is this good news for your wallet, but it also means you don’t have to worry about maintenance. 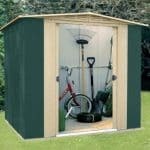 Once the shed is constructed you can simply start storing your items. A 10 year anti-rust guarantee is supplied with the shed. It is worth looking into the terms and conditions of this warranty to ensure you know exactly what it covers. Sliding doors are a common feature on the Yardmaster metal sheds. It is a good design feature which presents a number of benefits. With standard doors, they can easily be blown open and closed if it’s a windy day. This can make transferring items in and out of the building problematic. The sliding doors will stay open or closed and won’t be affected by strong winds. The other benefit is the amount of space it provides you to enter the shed. The doors slide across the entire width of the building, meaning you get a huge amount of space to transfer large, bulky items. The shed is designed with privacy and security in mind which means there are no windows. This is a particularly good feature if your garden isn’t very secure. However, it does mean that there won’t be any light in the building once it gets dark outside. This is by far one of the most private, secure sheds available. However, it is worth mentioning that a lock is not supplied with the building. It is highly advised that you buy a strong padlock to ensure it is only you that has access to the contents. Once a lock has been supplied, the shed will not be able to be broken into very easily. Thieves will not be able to break down the metal and it is also resistant to fire. With no windows, the shed also provides maximum privacy. Usually we would be discouraged that there are no customisation options or extras available. 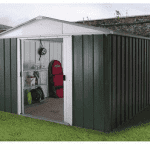 However, what we’ve discovered with Yardmaster metal sheds is that they don’t actually need customising. They have a fantastic design with plenty of security, durability and privacy features included. In fact, the only thing that could benefit this shed is extra stability that would usually be provided by a floor. However, Walton’s do have this covered in the form of an anchor kit. So why can’t you see it on the shed’s product page? Well because Waltons supply the kit free of charge with this building. The free anchor kit helps to fix the structure of the shed down onto the base. It is designed to be used alongside paving slabs and concrete, but is not suitable for timber decking. You can get a separate timber decking kit if needed. What’s great about this kit is the screws you are supplied with can be easily removed if you need to move the shed for any reason. Waltons is the one manufacturer that consistently receives a 10/10 rating for quality. No matter what materials they use or how low the cost, you can always guarantee you’re getting a high quality building. Even without treatments this shed will last a decade thanks to its exceptional quality materials. The depth and width of this building ensure you get a good deal of storage space to store your tools and equipment. The apex roof also provides extra height, letting you store taller tools. We advise that this shed will take at least a few hours to put together depending upon your skill level and how many people are involved with building it. However, there is the potential it could take a lot longer. What we do like is the hemmed edges which are designed to make the panels safer to install. 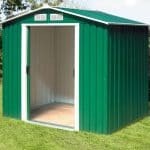 The value for money you receive with this shed is fantastic. It is extremely affordable, yet it boasts a long wearing, durable design. As you don’t need to spend any money on treatments or upgrades, it makes the shed even better value for money. Final Thoughts: This is a very strong, impressive building that is useful for storing heavy machinery as well as tall, bulky items. 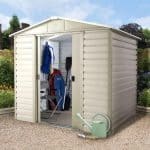 It is one of the best quality metal sheds we’ve reviewed thanks to its excellent collection of safety features. Not only is it guaranteed to last, but this shed is also really private and secure. So you can rest assured that whatever you do choose to store in here will be safe all year round.